Body Language PowerPoint templates, backgrounds Presentation slides, PPT Themes and Graphics. Download the innovatively designed Body Language PowerPoint Templates to educate your colleagues about the importance of it. Inform your audience that study of the body language is known as kinesics. Explain that it is a kind of non-verbal communication. Discuss how facial expressions, body postures, gestures, and eye movement can express thoughts, intentions, or feelings. Incorporate different types of visuals to showcase it plays an important role in any organization. It is relevant to management and leadership. It is significant to all aspects of work and business where communication is seen and physically observed among the people. Use apt PowerPoint graphics in your presentation to explain its index. Demonstrate that facial expressions, gestures, body postures and eye movements all say something about the person, whatever is happening on the inside can be reflected on the outside. Body language can help you learn about the people. It puts you in a better position to communicate effectively with them. Go through the awesome collection of Body language PowerPoint Templates to help your audience feel confident about themselves by explaining the importance of it. These template are completely customizable. You can edit the color, text and icon of these PowerPoint templates as per your requirement. Make the changes and blend them in your presentation the way you want. Browse the collection of creatively designed Body Language PowerPoint Templates and educate your audience about it. 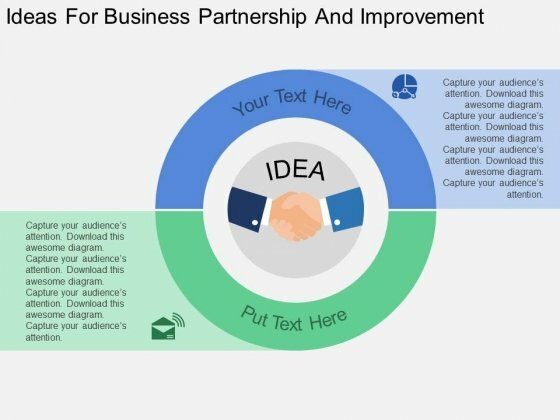 This business slide contains graphics of handshake with idea text. This diagram is suitable to present business partnership for improvement. Visual effect helps in maintaining the flow of the discussion and provides more clarity to the subject. Whatever the nationality,our Ideas For Business Partnership And Improvement Powerpoint Template are relevant. They have no ethnic bias. 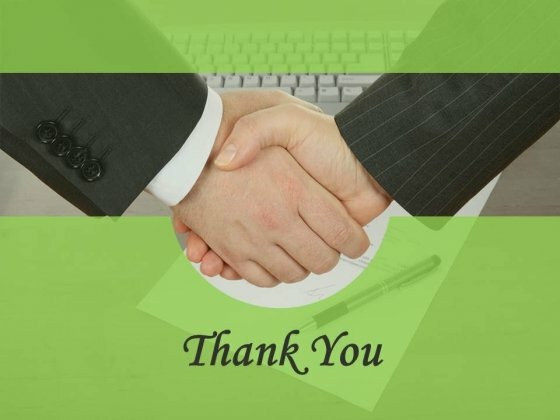 This PowerPoint template contains graphics of thank you text with handshake graphics. Download this PPT slide to build unique yet impressive presentations. You can easily customize this template to make it more unique as per your need. Take the plunge with our Handshake Thank You Slide Design Powerpoint Slides. Success will surely ensue. This business diagram has been designed with handshake graphics and scale in background. It may use to display opportunity, planning and strategy concepts. Prove the viability of your ideas to help your organization to achieve the quality and success required. 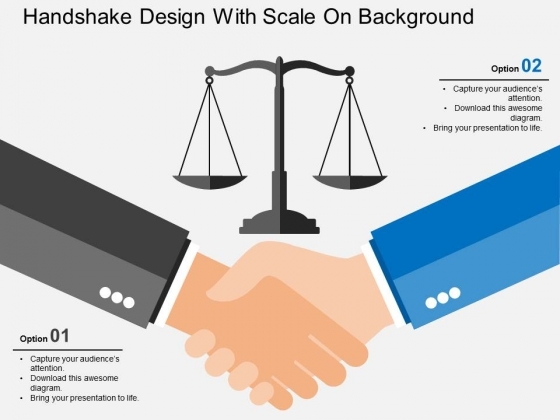 Take the plunge with our Handshake Design With Scale On Background Powerpoint Templates. Success will surely ensue. 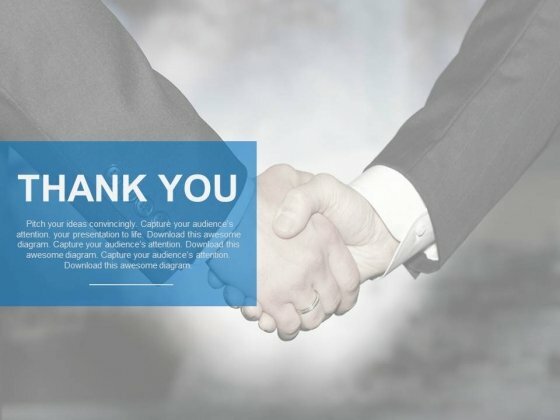 This PowerPoint template contains graphics of handshake with thank you text. Download this PPT slide to make the last slide of your presentation. You can finish your presentation by using the Thank You PowerPoint template. Take the plunge with our Handshake Thank You Slide For Business Powerpoint Slides. Success will surely ensue. Concept of business partnership has been represented in this power point template. 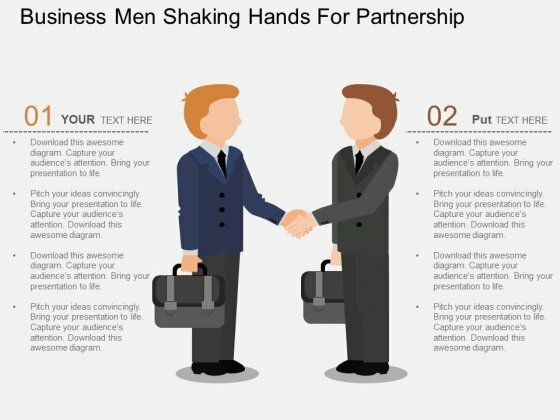 This PPT diagram contains the graphic of business men shaking hands. Use this PPT diagram for business and management related presentations. 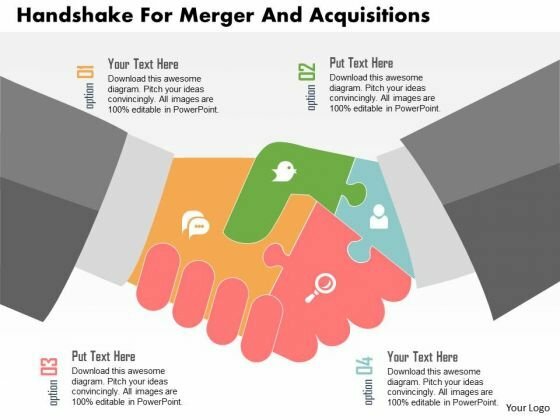 Take the plunge with our Business Men Shaking Hands For Partnership Powerpoint Template. Success will surely ensue. 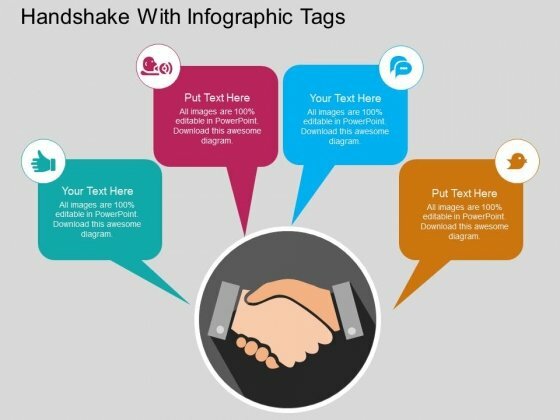 This PPT slide illustrates diagram of handshake with Infographic tags. You may use it to represent concepts like business deal and partnership This diagram is suitable to display business information in interesting manner. Take the plunge with our Handshake With Infographic Tags Powerpoint Templates. Success will surely ensue. Our above slide contains graphics of human handshake with puzzles pattern. You may use this diagram to depict business partnerships and mergers. This slide will make your presentations outshine.